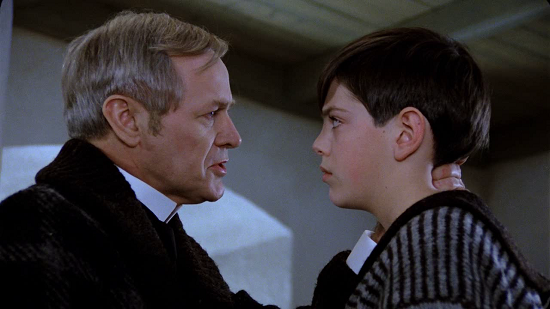 “Fanny and Alexander” is a dream-like summing up of Ingmar Bergman’s prestigious cinematic career, offering voyeuristic insights into the events of his youth that shaped the artist. 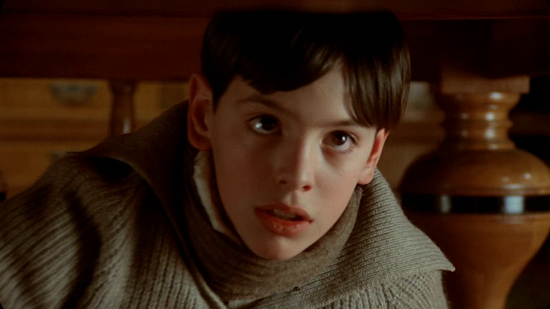 Though Bergman made allusions to his own life in all of his films, Fanny and Alexander was his first overtly autobiographical film. Taking his time throughout (188 minutes to be exact), Bergman recreates several episodes from his youth, using as conduits the fictional Ekdahl family. 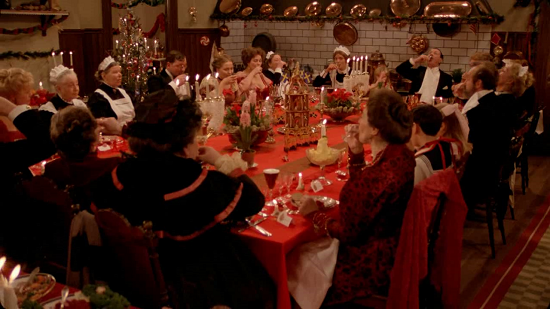 No wonder Oscars went to Fanny and Alexander for Best Foreign Film, Best Cinematography (Sven Nykvist), Best Costume Design and Best Art Direction/Set Decoration. 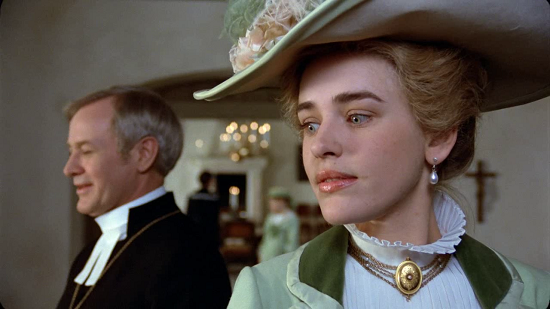 “Fanny and Alexander” is an opulent family saga, by turns bawdy, stark and strange. It is a feast of a film, bursting with characters, ideas and emotions. In it, Bergman celebrates sensation, imagination and the power of illusion, pitting them against his lifelong anxieties about religion and the difficulty of human connection. It's one of the most magnificent films in the entire oeuvre of Bergman and surely his last magnum opus. An opulent family saga, by turns bawdy, stark and strange. On a universal scale, it is a rich and glorious tapestry of life, family, love, hate, imagination, art, fantasy, reality, religion, magic, death, faith, spirituality, God, despair, redemption, youth, innocence, maturity, old age and the supernatural. It is all of these things and even more. Set in the early years of the twentieth century, the movie tracks the fortunes of an upper-middle-class Swedish family, headed by the widow Helena. We first meet the Ekdahls and Alexander, the director's alter ego, first seen at age 10; at the exuberant Christmas feast that opens the film. Her son Gustav is a restaurateur, a lusty, sentimental man who loves his wife and paws the maids. Karl, a professor is the weak son, drunk, chronically in debt, and abusive towards his German wife. The oldest son, Oskar, manages the family theater in which his young wife Emilie is one of the actresses. While rehearsing Hamlet one winter day, Oskar falls ill, and soon dies. Emilie is left with two young children, ten-year- old Alexander and Fanny, eight. Bereaved Emilie, still in search of her identity outside the theater, falls under the hypnotic influence of Bishop Vergerus, a handsome, charismatic, cold and distant Lutheran minister whose charming exterior masks a cruel fanaticism. He proposes marriage, and, in a casual but chilling aside, requests that Emilie and the children bring nothing from their former lives when they move in with him. Emilie and the children transfer from the gay, affectionate Ekdahl world to the spare, rigid Vergerus household. Stripped of their creature comforts and relaxed family atmosphere, Fanny and Alexander suddenly find their childhood unendurable. The Bishop takes a special dislike to Alexander, who lives for long stretches in worlds of his own making. We learn that the Bishop's first wife and two children drowned in the river that races past the house. Alexander tells a maid that he saw the ghost of the first wife, who told him that the Bishop locked them up and that she and the children drowned while trying to escape him. The maid informs on the boy. Enraged, the Bishop torments Alexander psychologically, applies a carpet beater to his backside and then locks him up for the night in the attic. Although disturbing to watch, the sequence brilliantly brings to life one of the movie's major themes. Alexander may have lied about the facts, but in using his imagination to rearrange the facts he reveals a larger truth. The Bishop does in fact seek to imprison and control the souls of those around him. The second half of the movie deals with Emilie's struggle to free herself and her children from the Bishop. As part of this struggle, Alexander is led deeper into the realms of magic and the supernatural. With help from their old friend Isak Jacobi (Erland Josephson), a Jewish antiques dealer, as well as some magic, the children are smuggled out of the house, but the Ekdahls' attempts to bribe or threaten the bishop into divorce fail. When Alexander and his sister are rescued from the clutches of the bishop, they are taken to the home of Isak Jacobi. It is an exotic world of mysterious rooms filled with antiques, artifacts and life-sized puppets. Here Alexander will learn the real power of the imagination, where, as the quote from August Strindberg's "Dream Play," which closes the film, states, "Everything is possible and probable... On a flimsy framework of reality, the imagination spins, weaving new patterns." 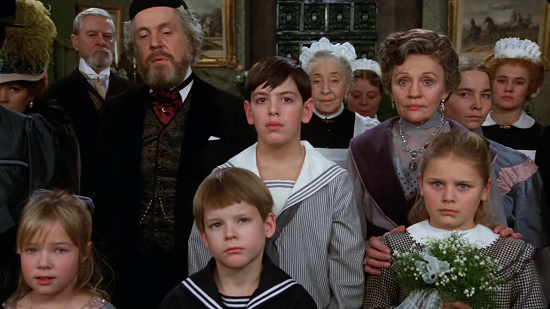 Unlike some of Bergman's earlier, bleaker works, Fanny and Alexander allows the life-denying rigidity of Vergerus to be subsumed by the warmth and humanity of the Ekdahls. 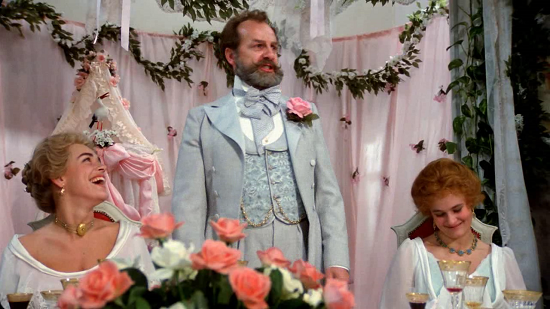 At a lavish family banquet, Alexander's uncle Gustav makes a speech extolling the virtues of living in the "little world" by which he seems to mean both the theater and the secular world of everyday human interaction. Bergman uses Gustav to state a decided bias toward small, made-made illusions over grand theistic ones. This bare bones summary of the three hour theatrical release (a five hour version aired on Swedish television) cannot do justice to the movie's teeming richness. Everything Bergman learned in forty years of film and theater directing is brought to a triumphant apotheosis. The sets, particularly Helena Ekdahl's apartment and summer house, are lavish; the period costumes are colorful and elaborate; Sven Nyquist's camera moves fluidly from sweeping long shots to lingering close ups. The enormous cast is superb. Gunn Walgren's mobile features summon up the soul of Helena Ekdahl, and Bergman veteran Erland Josephson imbues family friend Isak Jacobi with mystery and warmth. The movie's most mesmerizing performance is Jan Malmsjo as Vergerus; his abrupt shifts from charm to cruelty will make your skin crawl (Reminded me of the pastor in The Night of the Hunter). Although the entire story takes place in one town, it is epic in nature. We are treated to three generations of the Ekdahl family and the dynamics of its relationships. The joys, the frustrations, the disappointments, are drawn with precise and insightful strokes. We understand, for instance, how the emotional torment a husband is willing to inflict on his wife is, in truth, an expression of his own self-loathing; or how the innocent comment of a young woman can deflate a moment and bring a man's ego crashing down. Anyone not familiar with the works of Bergman will quickly realize he was a master of the close-up. The emotions laid bare on those faces are a testament to his ability to elicit performances from his actors that make those close-ups so compelling. Akira Kurosawa, the Japanese director, put it best when he said, "To be an artist means never to avert one's eyes." It would have been very easy for Bergman to pull away from an uncomfortable scene. For example, the gut-wrenching wails by Alexander's mother over the body of her dead husband seem to go on much longer than necessary for the audience. But he holds on. His characters bear the unrelenting moment unfolding on the screen just as we must in life. In his quest for truth, not only does Bergman hold his gaze, he refuses to blink. This film is indeed Bergman’s magic lantern. It is a warm, indulgent, thoughtful, graceful, beautifully filmed work that fits nicely into Bergman’s oeuvre. There are frequent references to Shakespeare's Hamlet in the movie. 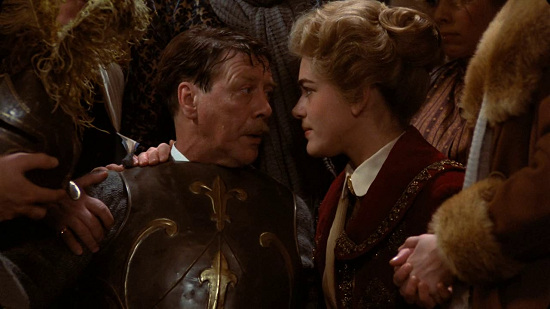 In its balance, richness, humanity and dazzling theatrical skill, Fanny and Alexander reaches the Bard's exalted level.